Invasion is closed during weekend so it will be pointless to see stamina which can’t be spend. I am pretty excited to see invasion rolled out to all servers soon. I think some of the enemy boosts need to be reviewed. 75% reduction in attack speed is especially criminal. When your fighting a Moana team when Moana alone has over 50k in power you just don’t have the capacity to stop her, and that is only the ward fight on it’s own. I’ve spent over 100 invasion energy trying to beat this and keep failing, I’ve also used all my tech points on power ups - still stuck. This is only day 2. My day 1 love for invasion has taken a huge kick. Maybe 50% reduction would be more appropriate. Can someone explain to me how I get to use these boosts? I tap on them, but all it does is tell me what they do. If I’m not mistaken, it highlights when you click on it, meaning you will use it in the fight. That way you can click it again to remove it if you change your mind. So is Invasion on server 8? Cuz i aint seen it. Click them, if description of item will show it means item is activated. Activated item have a small bright around. Thanks. I didn’t even notice the highlight around it. How quick does the invasion stamina regenerate? Im on breaker battle #54 in Invasion and the Shank enemy is not taking and damage. 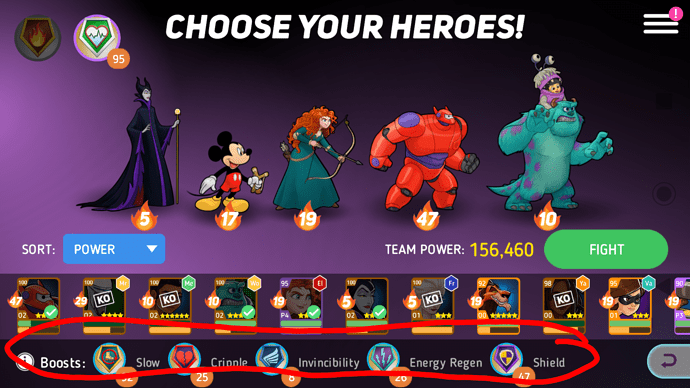 I’ve attack with many variations of heroes until time up but no matter what no red damage numbers show up. There is definitely something wrong in this stage. Does anyone know why I might be having this problem? Is it a glitch or problem with the game? I’m having the same problem, and I think it’s Shank’s white ability, which neutralizes damage. I don’t think I can get past her without a lot more hero powerups, which isn’t going to happen before this invasion ends. Next invasion I’ll try to use powerups better. I love the mode I think it’s just what the game needed. One big problem, if you think players can reach progress reward Tier 20, you crazy. 2 000 000 points? Players barely can reach 100000 points. Also rewards are not super for all this hard work achieving even these 200000 points for 1500 badge tokens? 120 stamina? 2000 disk power? Breakers should be much cheaper, after reaching high wave at solo mode, player is stuck and can’t get any breakers, ways or amount boss tech should be increased or make breakers cheaper. Boss, delete her stupid rage mode, one shot = one kill? How players could get more points if we need to waste a lot of breakers?? And delete Brutes as summoned enemy. Shank is a pain in a lot of scenarios, tied only with Darkwing Ducks his shield killing I personally find. My only real issue personally is that for a tough and as fast as you can start to lose people, combined with the way the power ups work, a 2 hour timer to revive heroes seems way too long. Sometimes I get in after waiting the two hours, only to battle twice before someone dies and I have to wait again. Shortening it to an hour and/or giving people a certain number of revives without waiting on the timer would help. Thanks everyone for the feedback! I am passing it along to the team to review. The issue with Shank is one that will be addressed before the Invasion starts next week. It’s a combination of power ups, her friend disk, and the ward powers that make her almost invincible. We’ll be taking a good look at the data once this Invasion ends to see how much progress players made. Keep the feedback coming! We’re making some changes to Invasion with the 1.8 game update. Check out the changes here!